SAN ANTONIO--(BUSINESS WIRE)--On March 13, 2019, Judge Robert E. Payne of the federal district court for the Eastern District of Virginia denied motions by JELD-WEN, Inc., a wholly-owned subsidiary of JELD-WEN Holding, Inc. (NYSE: JELD), to overturn a landmark antitrust verdict against JELD-WEN and in favor of Steves & Sons, Inc. (www.StevesDoors.com). The Court also issued an Amended Final Judgment that reiterates that, in order to restore competition in the market for interior molded doorskins, JELD-WEN will be required to sell its doorskin plant in Towanda, Pennsylvania, which it acquired as part of its acquisition of CMI. After the plant is sold, the new owner of the plant will be required to enter into a three-year Supply Agreement with Steves. The Court has appointed a Special Master, the Honorable Lawrence F. Stengel, Retired Chief Judge for the United States District Court for the Eastern District of Pennsylvania, to supervise the divestiture of Towanda and JELD-WEN’s compliance with the Amended Final Judgment. Doorskins are a critical component used in manufacturing interior molded doors, which is the primary business of Steves & Sons, a sixth-generation family-owned company founded in 1866 and based in San Antonio, with other facilities in Richmond, VA and Lebanon, TN. The company employs some 1,100 people. JELD-WEN is a multi-billion-dollar company which is one of the largest door manufacturers in the world. The company makes doorskins for its own door sales and also sells doorskins to other door manufacturers like Steves. 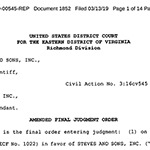 The Judge’s Amended Final Judgment concludes a series of events beginning with the unanimous jury decision on Steves’ antitrust and breach of contract claims. Steves then sought an order of divestiture that would require JELD-WEN to sell the doorskin plant in Towanda in order to restore competition in the doorskin marketplace for independent door manufacturers such as Steves. In a lengthy, detailed opinion issued October 5, 2018, Judge Payne substantially agreed with Steves, noting that after JELD-WEN’s acquisition of CMI, “JELD-WEN felt free to disregard existing contract obligations respecting pricing and began to engage in bullying tactics to get increased prices even if that would kill off some of the Independents who were its customers.” JELD-WEN’s anticompetitive conduct was described by the Judge as “evasive, sharp, and deceptive” and as “general bullying conduct toward Steves,” making judicial intervention necessary to restore competition in the marketplace. The Judge’s opinion said the Court would order JELD-WEN to sell the Towanda facility in order to restore the competition that JELD-WEN had destroyed with its illegal merger.